northwest Colorado Christmas Tree Farms: choose-and-cut Christmas trees, Tree lots with pre-cut trees, stands, sleigh rides, hay rides and related winter events and fun! Whether you want to cut your own tree, pick a live tree and have it cut for you, buy a tree already cut or buy a living tree you can plant, this page provides detailed listings of northwest Colorado's choose-and-cut Christmas tree farms, places to buy pre-cut (also called pre-harvested and fresh-cut) trees, stands, sleigh rides, hay rides and related winter events and fun. Some listings are for tree farms, others are tree lots, and some only offer hay rides, sleigh rides or other winter events. READ EACH LISTING to know what each facility offers. The farms are listed further down this page, so scroll down the page! Since this service is free and open to ALL Christmas tree farms, not just those who belong to an association or pay for an ad, like almost all other websites do, this is the most complete and current listing available! I'm always looking for more to add, and to correct any inaccuracies or errors, so if you encounter any, please email me ! And please tell the farmer you visit in northwest Colorado that you found their farm here! I need the farmers to realize that you found them here so that they will keep their information up to date! 3338 C Road, Palisade, CO. Phone: 970-523-0401. Open: from the day after Thanksgiving to December 22, Saturday and Sunday, 9 a.m to 4 pm, Tuesday to Friday, 12 pm to 4 pm. Directions: South on 32 Road, left or east on C Road 1 and 1/2 mile, farm is on your left or on the north side of C Road. PO Box 8569, Breckenridge, Colorado 80424. Phone: 970-453-4405. Fax: 970-453-8991. Email: bsr@colorado.net . Directions: Click here for a map and directions . Dash through a Winter Wonderland in the majestic Rocky Mountains, on a handcrafted red sleigh drawn by powerful Draft horses. We invite you to join us for a memorable experience that will be the highlight of your Breckenridge Colorado vacation. Gold Run Mountain Lodge Dinner Sleigh Rides. Enjoy live musical entertainment, the warmth of the stone fireplace and the premier bar. Scenic Fondue Sleigh Rides: Discover the magic of the mountains as your sleigh glides through open meadows with incredible views of the majestic Ten Mile Mountain Range. Included is a light meal of a tasty cheese fondue. Create a lasting memory as you listen to sleigh bells and delight in the frosty scenery. Exclusive Sleigh Rides: The Carriage Sleigh is truly out of a fairy tale. It is romantic, private and memorable. This intimate sleigh ride is the perfect setting for a proposal, anniversary or any special occasion. Four adults and two lap children are the maximum capacity. Sleigh Rides are approximately 40 minutes. A family, group or organization can reserve our beautiful, red sleighs for a private sleigh ride. Family Owned and Operated. RESERVATIONS REQUIRED. 48 hour cancellation policy. Breckenridge, Colorado 80424. Phone: 970-453-2005. Your evening begins with a sleigh ride on custom-built Santa sleighs pulled by huge Belgian draft horses wearing antique brass sleigh bells. 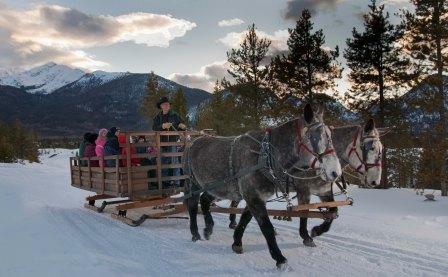 Under crisp Colorado skies, the horses deliver your sleigh to a recreation of an 1860's miner's camp. You'll feel as though you've gone back in time 140 years to Breckenridge's early mining days! As your sleigh is arriving at the camp you will be greeted by the sounds of "rag-time" being played on a piano made in 1895. For your meal, we serve great steaks, barbecue chicken or baked salmon dinners complete with hot apple pie for dessert. Much of your meal will be prepared on an antique wood cook stove that actually came out a mining camp in 1865. PRICING INFORMATION: Adults $75.00, Children (4-12) $53.00. Ride times begin at 5:00 pm and 7:30 pm each evening. Prices include Sleigh ride, dinner, show and gratuity. Transportation round trip to and from Breckenridge - $4 Prices do not include taxes. Kids 3 and under are free. Breckenridge, Colorado 80424. Phone: (800) 571-MULE (6853). Alternate phone: (970) 453-1520. Directions: Only 8 miles from Breckenridge and 1 mile from Frisco. From I-70, Frisco Exit #203, South on Highway 9, 1 mile. Frisco Nordic Center is on the left. Follow road straight to the log lodge. Click here for a map. Open: Monday through Saturday, Closed Sundays, Nightly trips at 5:00 pm to Cocoa Ride and 6:30 pm to Dinner Ride. the area's only mule-drawn sleigh ride! The Two Below Zero brand is a 3rd-generation Colorado brand, originating with my grandfather, passed to my father and myself. One day it'll belong to our son, Jacob. Climb aboard a handcrafted oak sleigh and nestle yourself under an antique lap robe. To the beautiful sound of sleigh bells ringing, a handsome team of mules will take you down a secluded, picturesque trail. Vistas of grand mountain peaks and towering pines await you at every turn along the relaxing ride. Arrive 30 minutes early to check in. We depart on schedule!!! Holiday departure times may vary. Dress for the weather - hats, gloves, warm shoes and coats are a must! Three 12-passenger sleighs are available. Trail is groomed daily. Christmas tree permits, which allow you to cut your own Christmas tree on public lands, are now on sale at National Forest/BLM offices and selected retail outlets in southwestern Colorado. This year's regional primary Christmas tree cutting dates are always set at the last minute (usually announced in late November) and take place in early December. In order to provide some consistency for the region, primary Christmas tree cutting dates are set which means that all tree cutting areas in our region must be open between those dates. However, some areas allow cutting as early as Thanksgiving and some allow cutting until the end of the year. Christmas tree cutting permits are generally available from most US Forest Service offices throughout the Rocky Mountain Region. Check out the informational links below or call the office of the closest Ranger District to the area you want to cut in to verify that they are offering Christmas tree cutting permits. Call the Public Lands Information Center (PLIC) at 303-239-3838 for more information or check out the informational links below. Permits: $10 each (last reported). One tree per permit. Limit 5 permits per person. All sales are final. Area Entry Hours: 8:30 am to 2:30 pm to For your safety, no entry is allowed before or after these hours. Routt National Forest - Last reported, permits were $10 per tree with a maximum of five per household. Have your permit with you when cutting a tree, to be secured to the tree at the time of cutting. San Juan National Forest - Last reported, permits costs $8, allows you to cut one tree up to 20 feet tall for personal use. The permits expire on December 31. White River National Forest - Last reported, permits were $10 per tree and may be purchased at the WRNF offices or the BLM Field Office in Glenwood Springs, Monday through Friday during normal business hours. For additional information, please contact the White River National Forest in Carbondale at 970-963-2266 or the Glenwood Springs BLM Field Office at 970-947-2800. Christmas tree cutting permits at Golden Gate State Park - Beginning November 12, a limited number of permits will be available for the Golden Gate Canyon State Park Christmas tree sale, just 30 minutes outside of the Denver metro area. All cutting activities will take plac on one weekend in early December. Unfortunately, the Parks rarely announce the dates online until the last minute (if at all; their website is gone and there is absolutely nothing available about them online - for those of you who want government to run healthcare... keep in mind they can't even do a good job with Christmas trees in a state park! ), so I can't tell you the exact dates and details - you must call the Visitor Center at 303-582-3707 for this year's information. Areas for both four-wheel and two-wheel drive vehicles will be available, with some hiking required. The tree permits will be available at the Golden Gate Canyon State Park Visitor Center located at 92 Crawford Gulch Road, 15 miles west of Golden. To reach the Visitor Center, turn west on Golden Gate Canyon Road, off of Highway 93. Permits will be sold from 9 am to 4 pm daily, while supplies last. Permits may also be purchased over the phone with a credit card by calling 303-582-3707. Visitors must pick up their permits at the Visitor Center prior to cutting. A detailed map with additional information is provided with each permit. The last update we had said the permit cost was $20, and permit holders are allowed one tree per permit. Permits will be discounted to $10 for those purchasing an Annual State Park Pass. A valid park pass is required on each vehicle. Daily passes are available at the Visitor Center the day of the cut for $6 per vehicle. Trees must be cut with hand tools, such as a handsaw or an axe; chainsaws and power saws are not prohibited. Christmas trees up to 15 feet tall or six inches in trunk diameter may be removed. Tree selections include Douglas Fir, Ponderosa Pine, Lodge Pole Pine and Rocky Mountain Juniper. Permit holders will be assisting Golden Gate Canyon State Park by thinning overcrowded dense vegetation. This selective thinning will improve the overall forest health and reduce the impacts of future wildfires. For more current information, see this page or contact the Visitor Center at 303-582-3707. Do you know of any Christmas tree farms or other special Christmas and winter events in northwest Colorado? Please tell me about them - Click here to write to me!